Note (2/9/2018): We have published an update to this blog reflecting passage of the Bipartisan Budget Act of 2018. It is posted here. Lawmakers reportedly have agreed to a budget deal that could increase deficits by $300 billion to $400 billion over a decade and set the stage for adding $1.7 trillion to deficits over the next ten years if parts of the deal are made permanent. The deal would significantly increase caps on discretionary spending by $296 billion over the next two years, provide over $80 billion in disaster relief, increase spending on health care in multiple ways, and retroactively extend tax breaks that expired at the end of 2016, among other policies. The deal apparently includes roughly $100 billion of offsets, though many may be budget gimmicks or one-time savings like selling oil from the Strategic Petroleum Reserve. While we don't have all the details or an official score, it is clear the deal would significantly worsen our nation's fiscal outlook – particularly if extended. Based on what we know, the budget deal would increase next year's deficits to roughly $1.2 trillion. Annual deficits would remain over $1 trillion indefinitely. It is highly unlikely lawmakers would allow a sharp $125 billion cut to discretionary funding to go into effect in 2020 when the deal expires. 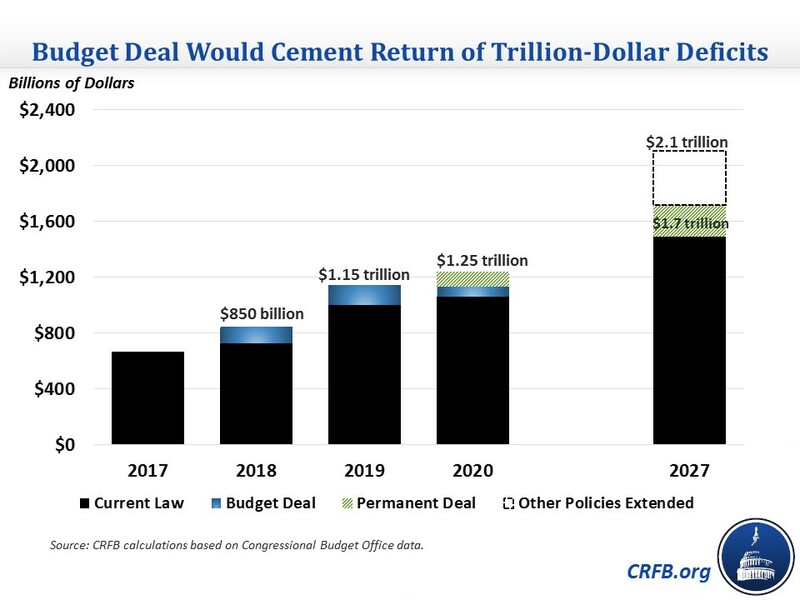 If the temporary policies in the deal were made permanent, deficits would rise to $1.7 trillion by 2027. If the recently-enacted tax bill and delays of Affordable Care Act taxes were also made permanent, the 2027 deficit would increase further to $2.1 trillion. Our estimates are extremely rough, as the full details of the budget deal have not been reported yet. 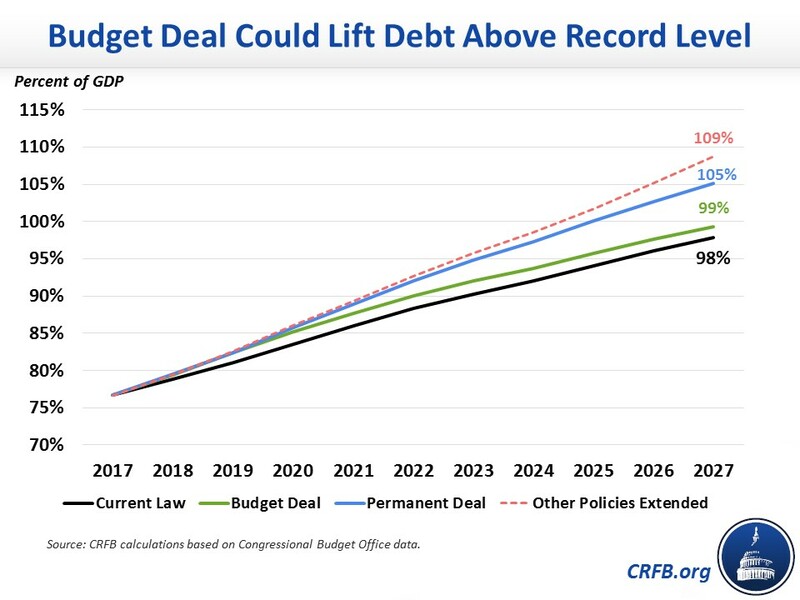 The budget deal itself would cause debt to rise to 99 percent of Gross Domestic Product (GDP) by 2027 - but if made permanent, debt would rise to 105 percent of GDP in 2027. With other tax provisions extended permanently, debt would reach 109 percent of GDP, higher than the previous record of 106 percent of GDP set just after World War II. After a $1.5 trillion tax cut and with debt already higher than any time since the World War II era, policymakers cannot afford to add hundreds of billions more to the debt. Instead, they should follow the precedent of the previous budget deals: set reasonable cap levels and offset the full cost with mandatory savings or new revenue.